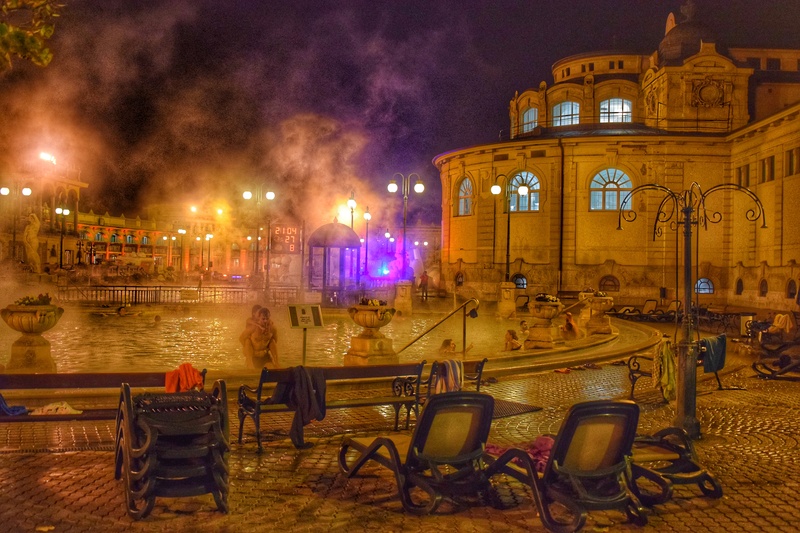 It’s probably not surprising that the one word I learnt in Hungarian on my recent trip was ‘furdo’, which means ‘baths’, as I spent most of my time swimming. 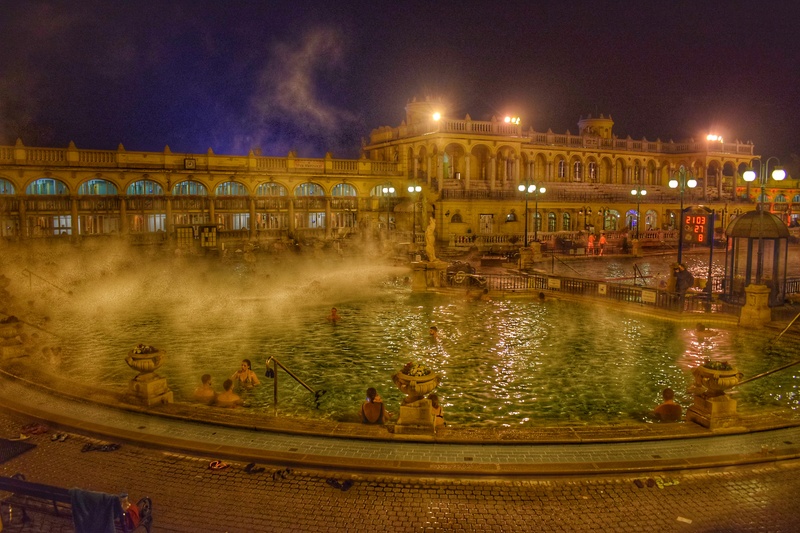 It’s even less of a shock when you realise that I decided upon Budapest as a destination almost entirely on the reputation of its swimming pools and thermal baths. 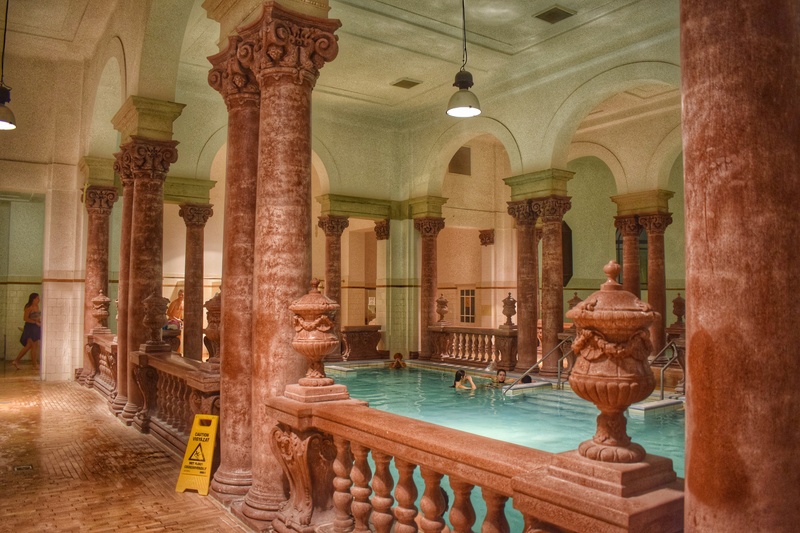 Hungary’s capital lies on a geographical fault, giving it instant access to natural-heated water and over the years, many baths have been built to allow visitors and locals to take a dip. 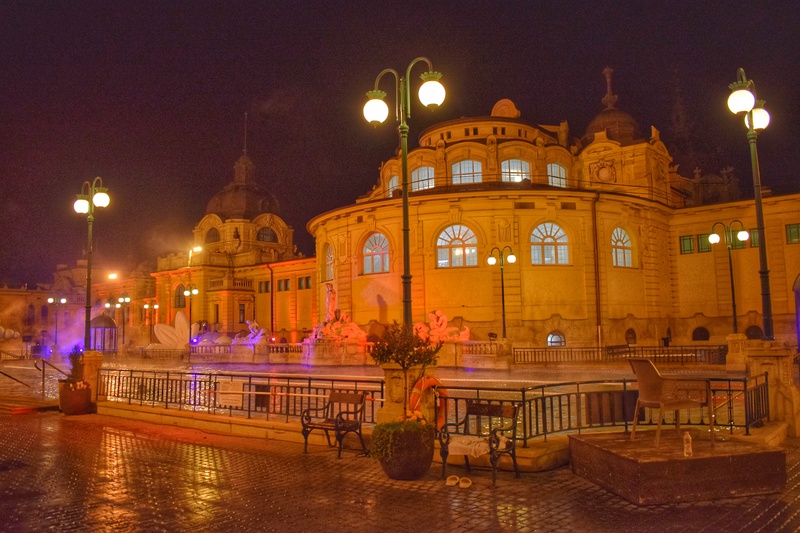 Among the most beautiful and ornate is Szechenyi Baths, which dates back to 1913. 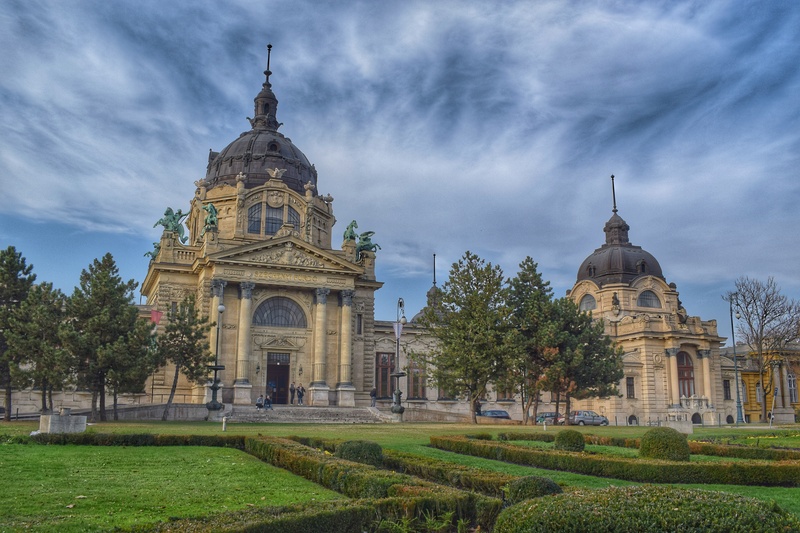 It’s said that swimming at Szechenyi is like being in a wedding cake and this is evident before you even step inside the building. The domed facade seems to be covered in a smooth yellow icing and the details are picked out in a frosting of white. 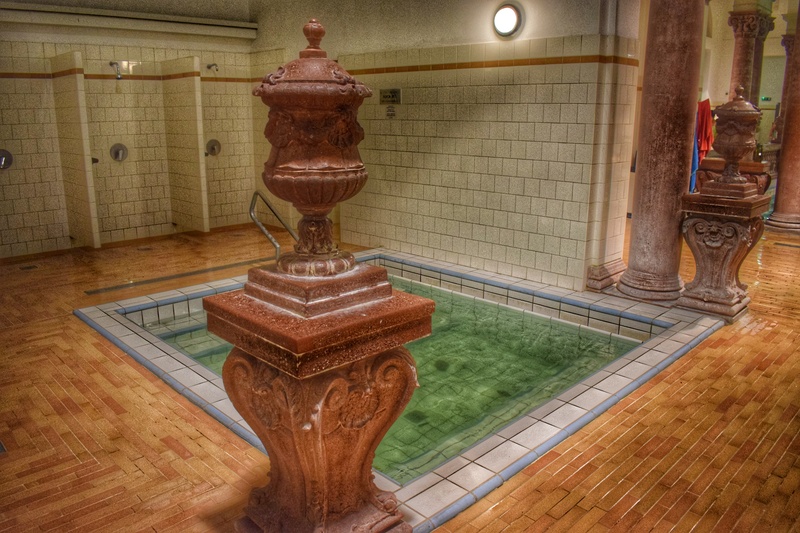 Jump off the yellow Metro line at Szechenyi Furdo (the clue is in the name) and the baths are right in front of you. My ticket cost 5,100 forints (£14), but bear in mind that prices vary depending on whether it’s a weekday, weekend or holiday, if you want a cabin or just a locker, a full-day or half-day entry and if you pay in euros. I swam in the evening, as it stays open until 10pm and it was a beautifully clear night. Upon paying my entrance fee I was given a wristband, which granted me access to the changing room area and is also used for the lockers. 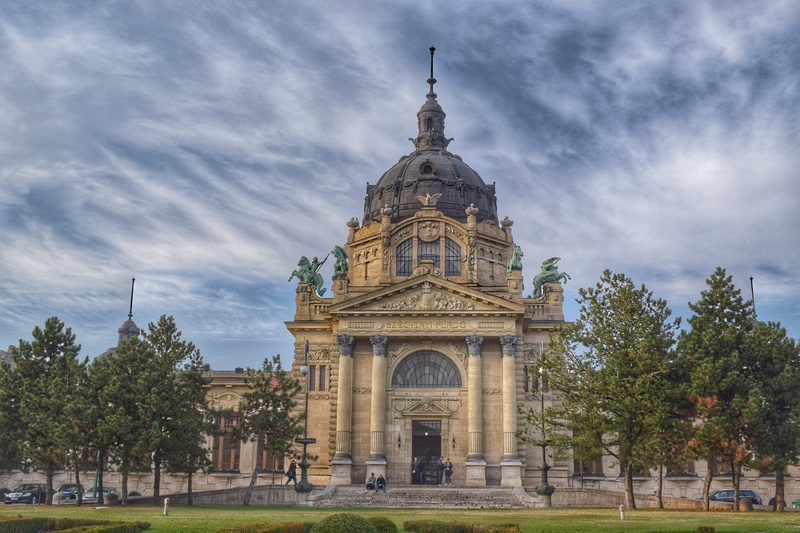 It’s a clever system and you can see why when you realise that Szechenyi is a huge complex, so it would take forever to find one specific locker. To lock it you simply wave the fob in front of the sensor and close. This links your wristband to the locker – just don’t forget which number it was, as it’s not printed on the band. Then, when you return, you present the fob to the sensor again and it will unlock. Getting changed kept me on my toes, as the wooden changing room I undressed in didn’t seem to be fitted with a lock. I hadn’t plumped for a luxurious cabin, but did come across these on my hunt for a swim cap later and they looked very swish. Once ready, I made my way through out to the pools, with the indoor baths the first that you come to. Here, you can splash about in the sulphate, magnesium and bicarbonate-rich water taking it all in. While not as ornately decorated as the Gellert Baths on the other side of the river in Buda, this indoor space is tiled and clean. Outside is the real star of the show, however, and you are greeted by a large thermal pool once you descend the steps. This is where the majority of visitors were bathing when I arrived, but to my delight, I discovered that beyond this there is a beautiful 50-metre pool designed for lane swimming. After just half a length, I heard a whistle blow and turned to see the life guard making a gesture towards his head. I swam back the way I’d come, climbed out and walked towards him. He explained that I needed a swimming cap to be in this pool and I asked where I could get one. Down the stairs and to the left, he said, as he pointed to the other side of the pool from where I’d got changed. Off I went, down the stairs and to the left in my bikini, where I found a lady stood behind a desk and surrounded by freshly-laundered towels. I inquired about a swim cap and she said 1,200 forints (£3.30). I retraced my steps all the way back up the stairs and past the pools – outdoor and in – to my locker, where I carefully counted out exactly the right money to buy the cap (there’s nowhere to store change in my bikini!). With cap stretched over my head I returned to the lane swimming pool and completed 20 of the most contented lengths of my life. Swimming outside at night is always wonderful and then taking in the beautiful details of the surroundings was just even more special. I caught just short of pitching myself to ensure that the moment was real. The swimming cap policy meant that there were only a handful of swimmers in this pool, offering the luxury of space. 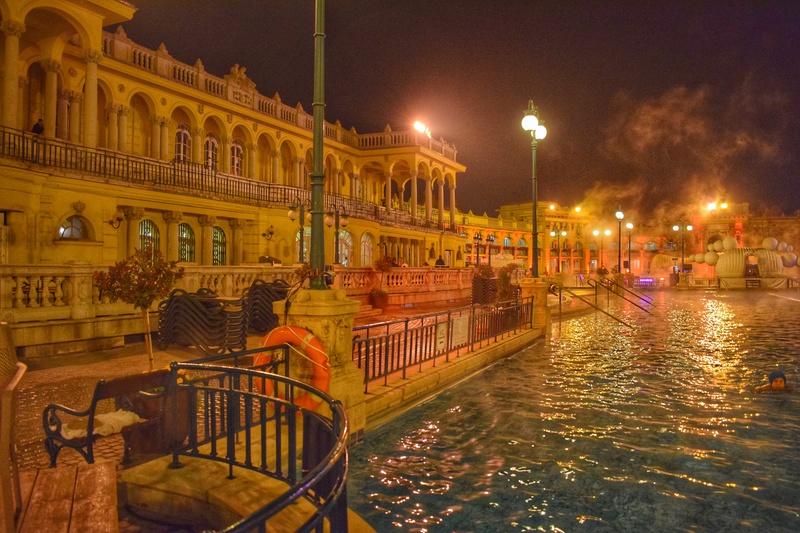 It was so good to find out that these world-famous baths have provision for real swimming, allowing those who want to enjoy the thermal pools their own space and lap swimmers a dedicated section too. 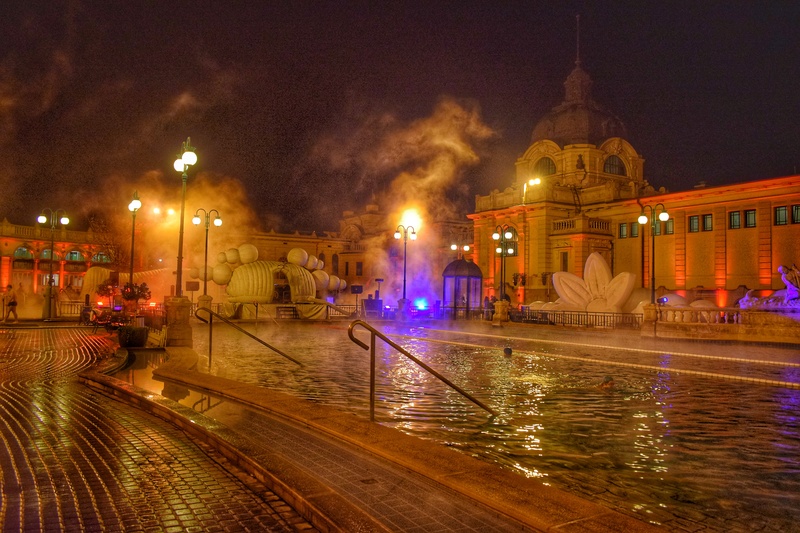 I am in Budapest at the moment, and will certainly try Szechenyi now. Haven’t been there yet. Out of the baths I visited, I liked Rudas baths the best. Gellert felt very touristic, didn’t spend much time there. 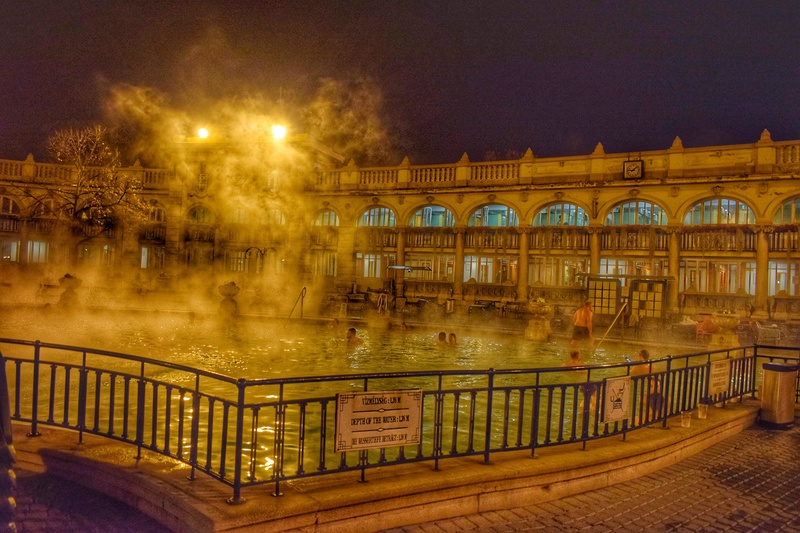 In any case thermal baths are a legitimate reason for traveling like you did! Especially in colder weather. It’s freezing now, but those baths will get you going sooner than you think! 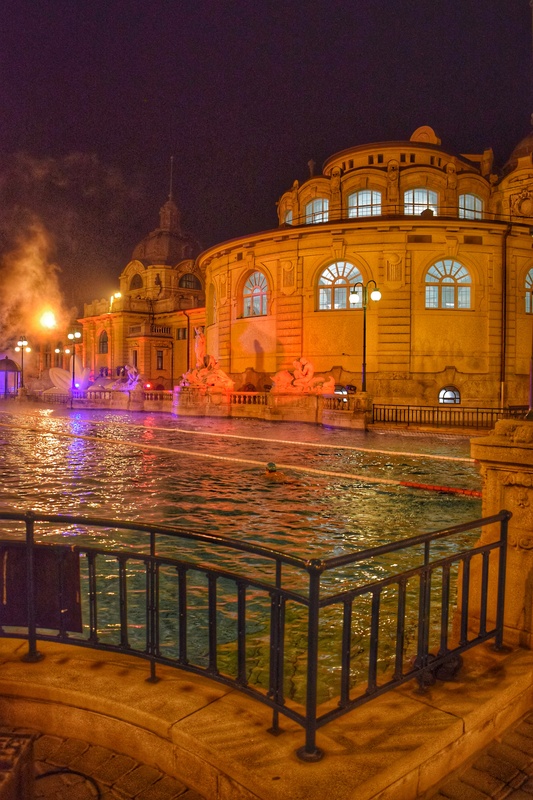 You must visit Szechenyi – it’s a very special place to swim. I went to Gellert too and know what you mean about the tourists, but it was still beautiful. 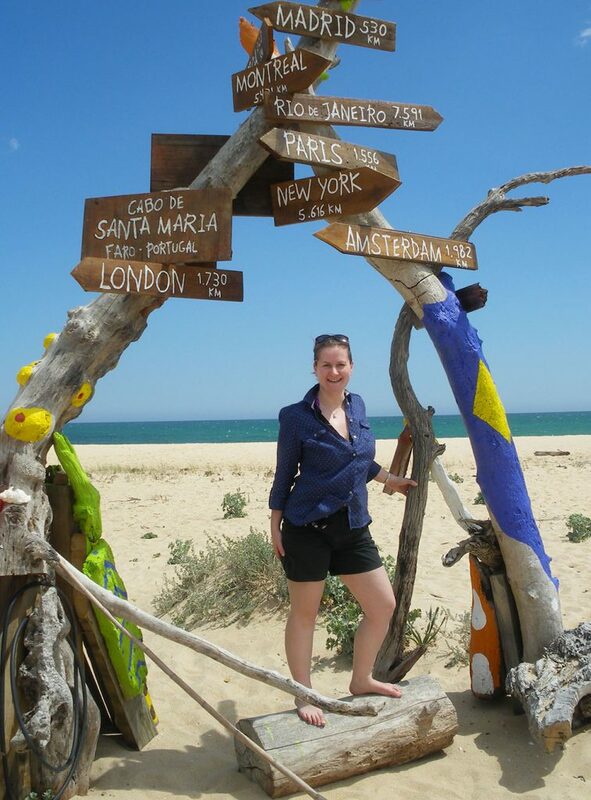 Really must go back so I can try Rudas and some of the others. 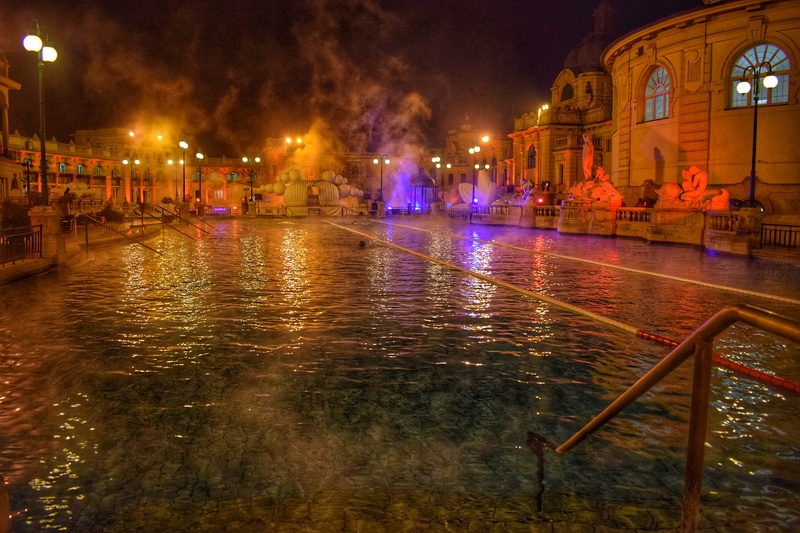 The thermal water certainly does make swimming in the winter even better. I remember doing this on a trip to Budapest back in 2014. It was so fun! What a cool experience. Budapest is an awesome city. 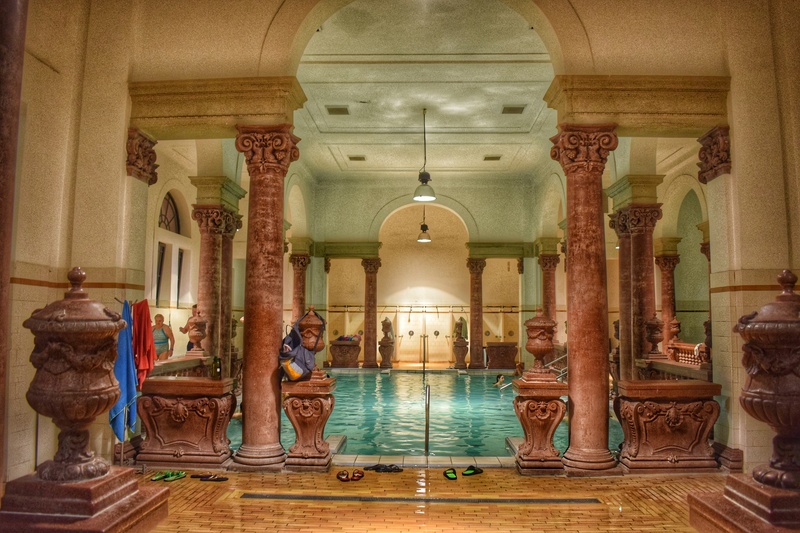 Budapest is such a special city and the baths are a big part of it. Glad to hear that you have such lovely memories of your own visit, Riana.